I currently run a Toyota 3SGE Gen 4 motor (single VVT) with a V88. I am controlling cam timing and until now, I have utilized the VVT target table format which reflects degrees of advance from the fully retarded intake cam position. I have utilized a full 46deg cam advance range at mid rpm. Can you confirm the degree advance value in the table is cam degree and not crank degrees. I now wish to change the table to reflect Intake cam LCA. After making the change, I am not seeing the LCA values I expect to see. I have set the full retarded position as 146deg ATDC. All previous advance values in degrees have now been added to the full retard value of 146deg within the new table. For example, +20deg from the original table now reflects as 166deg. I expect to see 126deg. Can you confirm that a 20deg change in the LCA target table = 20deg on the crank and 10deg on the cam. Yes you are right, the centerline mode doesnot work correctly, it appears from the way the help file is written someone has got it wrong and assumed intake centreline is BTDC, not ATDC, so it is displayed wrong. I can confirm all numbers in the VVT tables are crankshaft degrees. As always, your speedy response is appreciated. Thank you for clarifying "I can confirm all numbers in the VVT tables are crankshaft degrees"
It is a pity about the LCA table but, so be it. Sorry to bother you again. Are you 100% certain that the values in the VVT target table are crank degrees? The intake VVT pulley has a physical range of adjustment of +-47degrees (cam degrees). This would equate to 94deg crank angle. When I insert a target advance value of 47degrees into the VVT table, my log files and run time table show an actual Intake advance value of 47deg. If this is crank angle, then this would equate to 23.5deg movement of the cam. I should then be able to insert a value of 94deg advance in the target table with a corresponding cam movement of 47deg equivalent to the maximum possible cam advance. 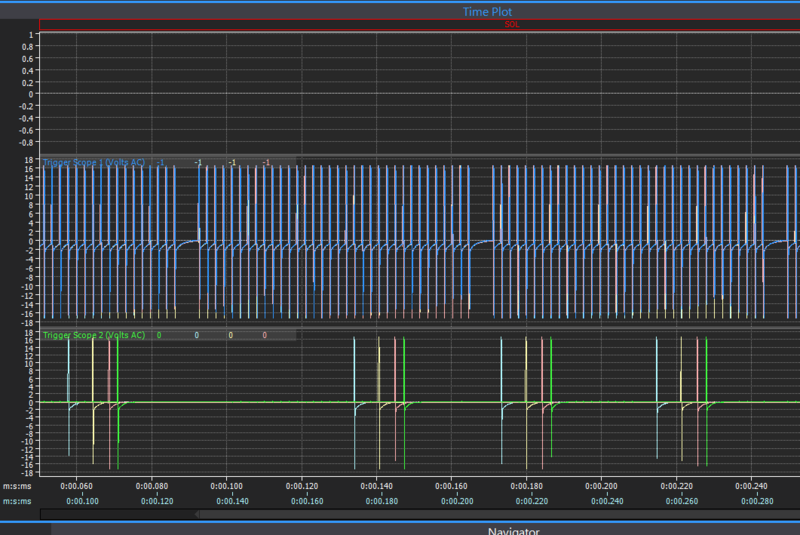 I would then expect to see logged and runtime values for Intake cam angle of 94deg. However, I can insert any value greater than 47deg in the table but it will not advance more than 47deg as logged and viewed in the Run time tables. This leads me to think that the advance value in the table is a cam advance (1/2 crank angle) value and not crank angle. Please will you check this and confirm. The intake cam closure point is directly linked to dynamic compression ratio. Too much DCR and I will run into detonation problems. I broke piston ring lands recently and I suspect it may be in part linked to too much cam advance with a resultant high DCR. DCR is easily adjusted by limiting my maximum intake cam advance but I need to understand which number I am working with in the target table. It is definitely crank degrees. My simulator only allows me to advance the cam up to 60deg and the ECU is still happy reading that for me, I believe the limit of our timing hardware is somewhere around 70deg. Below are 4 triggerscopes overlaid. Since this engine has a 36-2 crank, the spacing between the crank teeth is 10degs. The bright green cam trace is with cam at zero. The next one to the left (pink) is with my cam advanced 10deg - notice it has moved about 1 crank tooth (so 10deg crank). The yellow trace is 30deg advanced, again it appears to be exactly 3 crank teeth further left. Finally the pale blue trace is with the cam 60deg advanced, again it appears to line up about 6 crank teeth to the left compared to the zero position. I done this on a g4+ simple because it have a built-in scope but I done a similar test with a G4(V88). Have you done the cam angle test and set your offset up correctly? Thanks for the detail and check. Since the cam pulley has a physical range of movement of approximately 47deg in original format, I should theoretically be able to call for advance of double this value in the vvt target table. I've not yet conducted a cam angle test but will get to it tonight. Perhaps this is the missing link. I should theoretically be able to call for advance of double this value in the vvt target table. No, as I said above, there are various other limits at play. I know somewhere around 60 crank degrees should be possible assuming the mechanical bits are working correctly but no way are you ever going to get 94. No you can only physically advance the pulley that far, everything is working correctly. Hi David, it's been a while. Trust you're well. This is why I ask the question. The physical range of movement of the pulley, cam angle, is 47deg. If you insert any greater number than 47deg in the target table it will not move more. Where are you getting this info from? If I look search google images for 3SGE vvti pulley, there is no way that twisted spline thing can rotate it 45deg. Looks more like about half that in the pictures I see. I scratched out my sheet of measurements previously taken when I stripped a vvt pulley to ascertain the possibilities of limiting the range of adjustment. My bad, sorry, You are quite correct Adam, the pulley range of movement is just more than 23deg, equivalent 47crank deg as per the target tables. Apologies for questioning the topic again and again and thank for your input.